This is a preview of the card game Get Off My Lawn which is currently on Kickstarter. This preview is based on print and play components. The Kickstarter campaign ends on July 23rd, 2015. If you are interested in Get Off My Lawn check out its’ Kickstarter page. Shuffle all of the cards thoroughly. Deal one card to every player and place the rest of the cards face down to form a draw pile. The player who mowed a lawn most recently gets to go first. The objective of Get Off My Lawn is to have the most “valuable” lawn. Each player starts with a 3X2 yard filled with dirt. During the game players will place grass and various decorations on their lawn in order to improve the value of it. In addition to their lawn a player also has two locations where they can store cards. The player is allowed to keep one card in their hand which is hidden from the other players. Each player also has access to a shed. The player’s shed is the location where players can store cards to be used in future turns. The player can store up to three cards in their shed. All cards stored in the shed are displayed face up so all of the other players can see them. Draw one card from the draw pile. Play as many cards from their hand or their shed as they would like. Trade any cards except planted grass or negative cards from their hand, shed or lawn. Since players may only have three cards in their shed and one card in their hand, any additional cards are discarded. On a player’s turn they may play as many cards as they would like. Players can plant grass on their lawn as well as play decorations on patches of grass in their lawn. A player may remove a piece of grass from their own lawn. Action cards can be played for the effect printed on the card. Players can also play a negative card on another player’s lawn. You may only place one piece of grass on each piece of your lawn and only one decoration can be placed on each piece of grass. Once a piece of grass is planted it cannot be moved. If no decoration is on the lawn, the grass can be dug up and replaced with a different type of grass. You may not remove negative cards from your lawn unless you have the appropriate action card. You may not switch the location or pick up any cards from your lawn. You may trade or discard a planted decoration though. When the last card from the deck is drawn all of the players have the opportunity to play all of the cards in their hand and shed. When every player is finished the game ends. About a week ago I was browsing through the newest games on Kickstarter and I ran across a little game called Get Off My Lawn. What immediately stood out to me was the interesting art style and the theme about building a lawn. I highly doubt there has ever been another board game made about lawn maintenance. Since Get Off My Lawn had a print and play version on the Kickstarter page, I decided to try out the game. While the game has a couple flaws, I actually thought the game was pretty good. As a whole, Get Off My Lawn plays like most card games. Each player plays cards in front of themselves to score points while playing negative cards on their opponents. What I like about the game’s mechanics are that they are simple to learn but still provide some strategy. The instructions for Get Off My Lawn are about a page long and should only take a couple minutes to read through. Due to the simple play structure (draw card, play cards, trade cards, and discard), the rules are easy to explain in just a couple minutes. Due to the simplicity of the rules, the game is very accessible to even players who don’t play a lot of board/card games. While it is not the best game I have ever played, I had fun playing the game. Due to it’s short playtime (around 15 minutes) and its’ accessibility, I see Get Off My Lawn working great as a filler game. It is not the type of game that I would play over and over again but I could see it as the type of game that I would revisit every so often. One idea that I really liked in Get Off My Lawn is the idea of the shed. Just like an actual shed, the shed in Get Off My Lawn is essentially a storage area for your cards. I think it works really well. What I like about the shed is that it lets you keep cards to use in future turns but it also prevents you from hoarding cards. You can only keep a total of four cards between your hand and shed so players are forced to eventually play cards or discard them. The shed is a good idea since it lets you keep cards for future turns but at a cost. The disadvantage of putting cards in your shed is that all of the other players can see what cards you have. There are cards that allow other players to steal from your shed so any card you put in your she is also in danger of being stolen. Due to these disadvantage you are best off keeping your best card in your hand so no one can see it. The biggest problem that I had with the game was that in my opinion there are not enough cards in the game. I tried the game with four players and with that many players the game seemed to end almost as soon as it began. The game has 62 cards which means in a four player game, each player will only get about 15 cards. That just didn’t feel like enough cards for each player. While this problem doesn’t ruin the game, it does make the game feel like it ends suddenly. With the lack of cards in a four player game, it doesn’t seem like there is enough time to really implement a strategy. Players essentially have to just play the cards they end up getting since players don’t get enough cards to be choosy on which cards they want to play. In a four player game you will have a very hard time getting any of the bonus points for your grass layout since you will be lucky just to get enough grass cards to fill your whole yard. Two players in the game I played weren’t even able to get enough grass cards played to their lawn to complete their full yard. The lack of cards in the four player game makes the luck of the draw a more prominent issue than it needed to be. No matter how good your strategy is, you won’t win the game if you don’t draw well. While there are some cards that let you steal cards or mess with other players’ cards, whoever draws the best cards will likely win the game. This is a problem with the four player game but I am guessing it is not as big of an issue in the two and three player games. I didn’t try the two and three player games though so I can’t verify that fact. With less players each player will get more cards which should mean that they will have more flexibility in what cards they end up playing. I personally think that three players will be the optimal number of players for Get Off My Lawn. I see a potential issue with two players due to the negative cards and special action cards that target other players. With only two players I think the game may turn into a bloodbath where both players constantly attack one another with negative cards. Other than not having enough cards, I think too many cards are dedicated towards hurting the other players rather than building up your own lawn. Twelve of the cards are used to directly hurt another player between planting negative effects in other players’ yards to stealing cards. Another five cards are used to either prevent players from messing with your lawn or fixing damage done to your yard by other players. Almost a third of the cards in the entire game are dedicated to messing with other players. I actually like the idea of messing with other players’ lawns. The game would have gotten boring pretty quickly if no one was able to mess with each other. Having almost a third of the cards dedicated to messing with other players is too many though. With so many of these cards one player can easily be forced into becoming the neighborhood hooligan. In the game I played one player could not draw anything but these “negative” cards. They had a hard time even planting any grass since all they could do was hurt the other players. While the artwork will not be for everyone, I liked it quite a bit. The artwork has a nice cartoony feel to it which goes well with the not too serious theme of the game. How serious could a game take itself where you can vandalize one of your neighbor’s lawns by placing some “number 2” on their lawn? As a whole the game is pretty quirky which won’t be for everyone but some people will enjoy the theme. Overall I would say that Get Off My Lawn is not a bad card game. The game is very accessible and is quick to play. It is not the type of game that I would play multiple times in a row but I think it would work well as a filler game since a normal game would probably take less than 15 minutes to complete. One issue I had with the game is that I felt there could be more cards for the four player game. The game should work fine with two or three players though. I also think that there could have been a few less cards of the “attack another player” variety. I like the idea of messing with other players but I think the game has too big of focus on that aspect of the game. Overall if the theme and the mechanics of the game interest you, I think you will like Get Off My Lawn. If neither interest you, Get Off My Lawn is probably not for you. For those of you who are not sure whether you will like the game, you can actually try out the game before making a pledge. You can print off the print and play components from the Kickstarter page. If you have a copy of the Steam game Tabletop Simulator you can also try out the game for free. 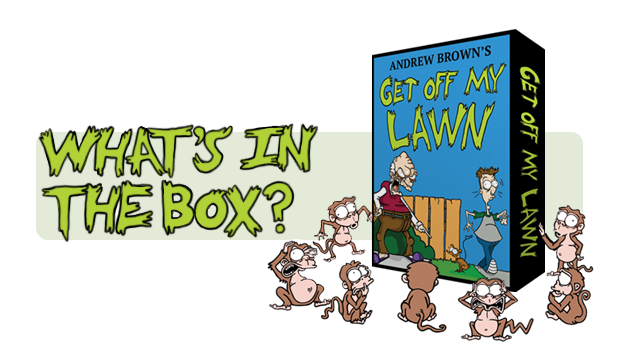 If you are interested in Get Off My Lawn, the Kickstarter runs until July 23rd, 2015. With a pledge of $15 CAD or roughly $12 USD, you will receive a copy of the game if it is successfully Kickstarted. You can check out the Kickstarter page for more information. The artwork is very stylized. The game has some interesting mechanics. Will probably work better with two or three players due to not having enough cards. Luck of the draw has a big impact on who wins. The game has too many cards that mess with the other players.